Microdermabrasion was once only available in luxurious spas and salons, but today, you can bring spa-like microdermabrasion into your home to upgrade your skincare routine. Complexion MD Microdermabrasion Polish may give your skin a smooth, healthy look and feel. Best of all, it costs less than what most top spas charge for a facial. Complexion MD Microdermabrasion may give you the spa-quality dermabrasion you want, in one easy to use package. Microdermabrasion was once only available in luxurious spas and salons, but today, you can bring spa-like microdermabrasion into your home to upgrade your skincare routine. Complexion MD Microdermabrasion Polish may give your skin a smooth, healthy look and feel. Best of all, it costs less than what most top spas charge for a facial. 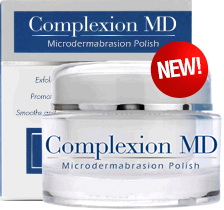 Complexion MD Microdermabrasion Polish was designed to help nourish your skin as it polishes it. It is balanced with ingredients like jojoba seed oil, cucumber extract, and aloe vera. These are intended to keep your skin from getting irritated when you use the product. This may ensure your skin will be both glowing and soft afterward. Rub a quarter-sized amount of Complexion MD Microdermabrasion Polish into your skin, then continue to massage in for 1-2 minutes. Rinse well and continue to use 2-3 times weekly. The Pumice in Complexion MD is ground to a fine consistency so it may help polish skin until smooth. Green tea doesn’t only make for a good drink, it’s also believed to be beneficial for your skin. Aloe Vera has been used by Native Americans for centuries to help nourish and protect skin. Sunflower Oil is said to moisturize skin and protect it from the elements. It also contains a large amount of vitamin E, which may be essential for healthy skin. Complexion MD Microdermabrasion may give you the spa-quality dermabrasion you want, in one easy to use package.